EPC Group designs, deploys and integrates unified communication (UC) strategies and solutions based on Skype for Business. We create a path for success by combining our “from the trenches” expertise, processes and technology to enable your workforce, partners and customers to communicate however and whenever they need. Our experts work with you to quickly integrate on-premise and cloud-based Skype for Business into your organization to manage all of your communication tools, including mobile devices. Skype for Business serves as a robust and cost-effective platform that can integrate into existing environments and can complement or replace your current voice and video platforms. Skype for Business is a robust platform that provides instant messaging, voice, online meetings and video conferencing. With the seamless implementation experience with knowledge transfer from EPC Group, your organization’s users will be empowered with a communication experience that will create a more efficient and productive workforce. EPC Group will develop a single unified interface that combines your email, voicemail, telephone and audio/video conference over an IP network providing the flexibility and capabilities end users demand. Our experts will explore your current challenges, areas for improvement and opportunities for expansion to create a realistic path to achieve your unique business communication needs. EPC Group will implement a sustainable technical architecture and repeatable framework to ensure a successful Unified Communications strategy that is designed for future growth, sustainability and compatibility. We will provide an end-to-end Unified Communication offerings with 360-degree support to meet your organization’s SLAs through our Hybrid IT model and engagement options for on-premise, cloud and a hybrid-cloud based architectures. Assessments: Our experts provide assessment services to explore your organization’s network infrastructure and readiness. EPC Group will provide recommendations, identify business requirements and report on findings and best practices for an action plan that will provide a successful (UC) path. Training: EPC Group provides any level of training needed to ensure you are able to take full advantage of Skype for Business’s features and capabilities. We offer end user training to gain full understanding of Skype for Business that yields a more productive and self-sufficient workforce. Our IT professional training focuses on the skills needed to administer and manage Skype for Business through live or virtual learning. Full Unified Communications Support: As a single source managed service provider we offer Skype for Business support services that prevent disruptions and keep productivity within your organization at optimal levels. We provide 24×7-365 day support services for IT teams, administrators and leaders tailored to your business structure and needs. 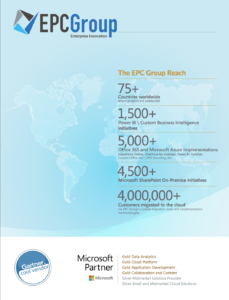 EPC Group’s extensive knowledge of the identity management covers Microsoft Identity Manager (MIM) and Forefront Unified Access Gateway (UAG) as well as Microsoft’s latest technology roadmap updates. Microsoft has moved away from the Forefront product line and into Azure Active Directory. EPC Group’s consulting services cover all areas of Active Directory Federation Services (ADFS) as well as Windows Identity Foundation (WIF) and Microsoft’s new claims-first approach. EPC Group’s team can also provide you with the proper architectural design, implementation and any custom development you require via REST API endpoints and the Azure Authentication Library which allows for secure sharing of tokens for secure API calls to meet your organization’s most granular technical. Managing and securing information is vital to any organization’s success. EPC Group’s experts will deliver our “from the consulting trenches” methodologies and proven architecture strategies around federated identity management solutions for seamless authentication and authorization. EPC Group diligently implements sound solutions to address regulatory concerns, security concerns and strategies to rectify and prevent productivity issues resulting from scattered sources of identity and security management. We understand compliance and the importance of an organization’s security infrastructure. Your organization’s information assets must be protected and EPC Group understands the level of information protection required to meet your needs.